I just got back from a week in Mexico with a group of families from my church, the first of two trips that we are doing this summer. Thirty-three moms, dads and their kids spent July 17-20 at YUGO’s Ensenada Outreach Center (EOC), a terrific base for short term missions in Baja. I’ve been there many times over the past 15 years or so with both youth groups and family groups and YUGO’s staff is always helpful and accommodating. I have to admit that on the first day of the week, I wasn’t sure I was going to make it through the week. Normally, my wife Marci goes with me and we arrange to get a private room at EOC rather than sleeping in the dorm rooms. Marci had back surgery the week before the trip so she couldn’t go on this one. So I stayed in the dorm room with all the other guys (16 of them) on a corner bunk in the back of the room. It brought back memories of being a cabin counselor at junior high camp, except there was a little more snoring from the adult campers. But as the week progressed, I got used to it and really enjoyed the time bunking down with all the other guys. 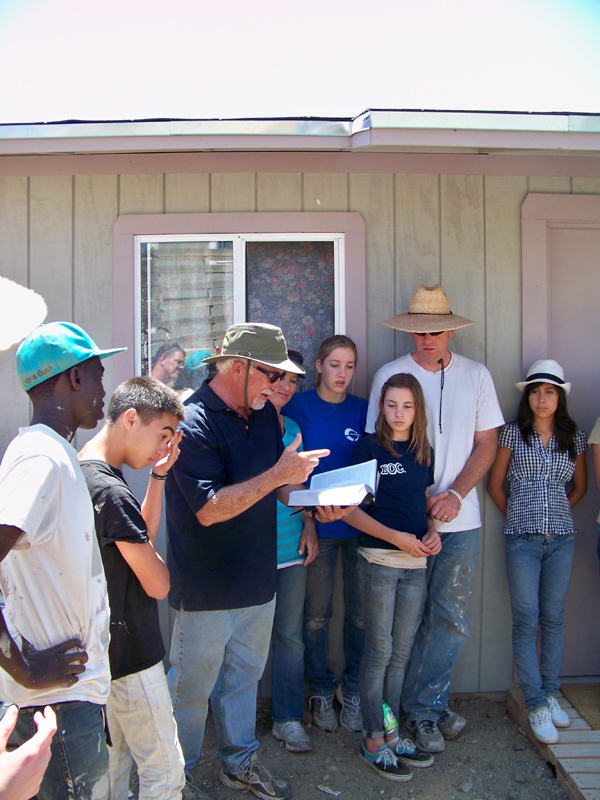 In just four days, our team built a beautiful new home for the Aparicio-Lopez family (mom, dad and two kids) who had previously lived in a borrowed home of one room and a trailer. They had no furniture, so we outfitted the home with three beds (a double and two singles), linens, a table and chairs, rugs, curtains and shelves filled with dishes, pots and pans and other cooking utensils. Our dedication ceremony and presentation of the keys to the house to the family was a powerful experience for all of us. “This is our dream come true,” they said as they entered their new home. As one of our team members commented afterwards, “We built them a house, but it became a home very quickly.” One of the children, a teen girl, jumped up on her bunk bed and just stayed there for the longest time. She couldn’t believe she now had her own bed. While half of our team built a house, the other half conducted VBS programs in two locations near the construction site. I spent most of my time with the VBS team. I’ve done this many times and over the years I’ve built several carnival-type games which are always a hit with the Mexican children. They love to win dulce (candy) and play juegos (games.). About 80 children came to our programs and memorized key Bible verses in Spanish. They also heard Bible stories about Jesus. Our team did a great job of presenting the Gospel in a very clear way and almost all of the children prayed to receive Christ as Savior on the final day of VBS. They heard Good News and they wanted it right then and there. On Wednesday night, we visited a small Mexican church, the home church of the Aparicio-Lopez family. The pastor preached a short sermon on John 4 (the woman at the well) and during his sermon pointed out that he was about 10 years old when he found Christ at a VBS just like the one we conducted. He came for the candy, he said, but found Jesus also. I played my banjo for the church and they loved it. I called it a “bano” and got a few laughs. 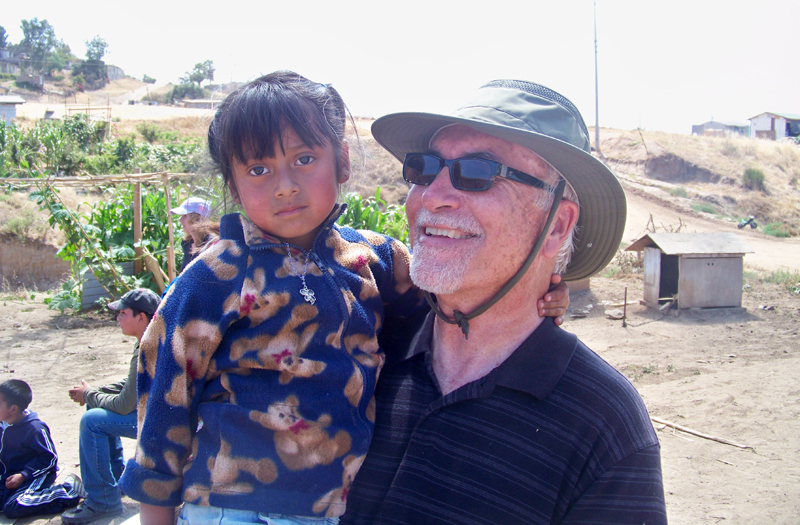 I am always deeply touched by these mission trips. Since moving from youth mission trips to family mission trips, I am even more deeply committed to them. It is a powerful thing to watch families serve God together on the mission field. Rather than having kids go home and try to explain what they did to their parents (which they almost never do very well), the family has a shared experience which powerfully impacts their family for years to come. This is our second year doing this at CABC and almost all of the families who went last year came again this year. And we have another trip planned for July, made up of entirely new families. Last year we took 25 people; this year we have 50. I’m hoping that this momentum continues. I was very happy that this year, nobody got sick. Last year, there was quite a bit of illness which spread through the camp. But last year, a group from Memphis Tennessee was in the camp and we believe that they imported the illness from Tennessee. We called it the “Y’all flu.” The only mishap this year was the breakdown of one of our vehicles in Tijuana on the trip home. But they made it across the border and everyone got home safe and sound. If you want more information about our family mission trips at CABC, contact me anytime. 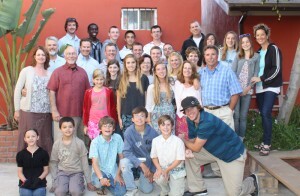 This entry was posted in College Avenue Baptist Church, Ministry and tagged College Avenue Baptist Church, Ensenada, Mexico, Ministry, Mission Trips, YUGO. Bookmark the permalink.